Renowned as the most romantic place on the island and as a sampling of paradise on earth, Hotel Tugu Bali is nestled on the pristine, wave-sung sunset beach of Canggu, surrounded by the whispering rice fields and the adjacent BatuBolong Temple. Hotel Tugu Bali was built upon a passion for the romantic beauty of the art, history and culture of Bali specifically and Indonesia in general. A vast collection of priceless Indonesian antiques and artworks adorn the hotel, blending pure tropical luxury with an out-of-the-ordinary ambience. The magical Bale Agung lobby, with the views to the Indian Ocean, houses an exclusive collection of historic Balinese artworks and cultural artefacts, among which are the impressive 4.9-meter tall wooden giant Garuda carved from a whole 120-years-old tree, and Boma head (mythological giant guardians) on top of soaring columns inspired by an ancient ceremonial house in central Bali. Surrounding the Bale Agung is a world of lush tropical gardens and wild lotus ponds, where each of the resort’s 21 villas and suites hides itself from one another. The Puri Le Mayeur Villa, occupying an area of 200 square metres, ‘floats’ above its own 700 square metre natural lotus pond. Chosen as the ‘sexiest’ suite in the island, this villa is inspired by a love story between Adrien-Jean Le Mayeur de Merpès, a famous Belgian painter who moved to the island in 1931, and Ni Polok, a renowned Legong dancer. The Puri Le Mayeur, furnished with beautiful original carved furniture of the artist, has a private plunge pool, an open-air lotus pond dining pavilion, a beautiful outdoor bath, and a verandah to witness the sun setting behind the breaking waves. Entering the Walter Spies Pavilion, the other signature suite of this hotel, one finds themselves transported to the romantic art deco era of Java in the early 20th century. This suite is dedicated to the German poet and artist Walter Spies, who made Java and Bali his home in the 1920s. The Walter Spies incorporates several original Dutch colonial architectural elements, including entrance gate, stained-glass windows, and a most beautiful private plunge pool, a private outdoor dining pavilion, a garden and the most unique outdoor sunken bath. The Dedari and Rejang Suites are far from being standard suites, each of which has been decorated with different artworks and color schemes. However, all have exotic luxuries such as oversized beds scattered with fresh petals at night, silvered local artisan’s sunken baths, private plunge pools and private in-room spa areas. All the Rejang Suites have a view to the sunset over the Indian Ocean. Dining at Tugu Bali takes on a completely different concept than in any other hotels in the island. Guests are welcomed to choose wherever they like to dine. Beautiful private candlelit tables can be arranged everywhere – in the gardens; at a private hut floating above the lotus pond, at the private candlelit beach under the star, etc. Furthermore, instead restaurants, the hotel provides various most unique and authentic dining experiences. In each experience, the venue, the atmosphere, the cuisine, the rituals, the costumes, the tableware – all differ from one to another depending to the themes chosen. In some cases, a dinner for two can be served by a parade of 12 waiters or a 14th century army of 30 people depicting the many forgotten romantic tales of Indonesia’s history hundreds of years back. An absolute must would be to dine in what is said to be the most beautiful dining room in the country – the 300-year-old Bale Sutra temple, housed in a spectacular red room and lit with many red candles. To experience the grand, elegant dining of the royal Balinese kings in the past, opt for the Bale Puputan, Balinese 19th century royal dining room of the kings, dedicated to Balinese heroes. For a most memorable cultural dining experience, everyone’s favourite is the WaroengTugu, a very atmospheric, humble open-air traditional 15th century village-kitchen lit only by oil lamps. Iboe (Mother) Soelastri, who now more than 60 years old but has inherited her grandmother’s cooking talent since she was 4, cooks in the terracotta wood-fire kitchen in front of guests. She also invites guests to join her to the market before her cooking classes. Known as serving the best Indonesian (Balinese and Javanese) food in the island, many see Tugu Bali and the other Tugu properties as the reference in Indonesian culinary in the nation, catering to a row of presidents and ministers of Indonesia. 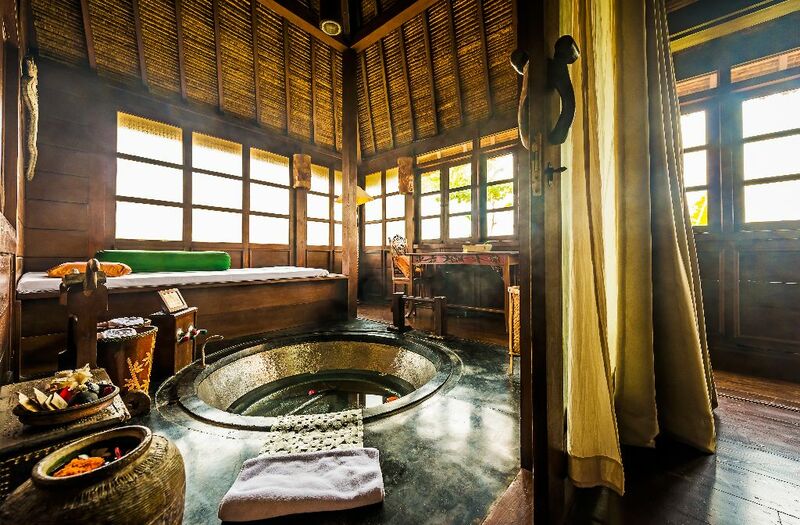 The Waroeng Djamoe Spa, listed in the past two years as one of the world’s bestas well as one of the Asia’s best, practices treatments that range from pure indulgence to peace of the soul. From treatment that is based on the traditional Balinese dances; spiritual therapy combining the chanting of mantras and the application of heated exotic herbal oils; yoga, pilates, and water pilates practice that bring the body and mind in harmony with the surrounding nature; to heavenly hot stone massages using spice-soaked volcanic stones, the Tugu spa experience is a compulsory beginning to any stay in Bali.